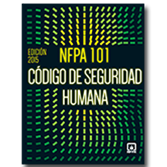 Protect people where they live, work, and play with NFPA®'s Spanish edition of Life Safety Code -- the most widely used source for strategies for occupant safety throughout the life cycle of a building. As the built environment and risks evolve, so do the challenges to protect people from fire and related hazards. The 2015 Spanish Life Safety Code provides a flexible approach that adapts to nontraditional use of buildings; innovative designs; and new technologies, materials, and construction practices. It is the only document that addresses life safety in both new and existing structures. Essential for architects, engineers, building owners and building managers, hospital administrators, and AHJs, the Spanish NFPA 101 covers it all: Egress, sprinklers, alarms, emergency lighting, smoke barriers, and special hazard protection.